This Raspberry Cream Cheese Danish Recipe has a golden pastry dough topped with sweet cream cheese and raspberry is divine. 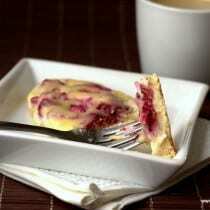 Splurge on this indulgent brunch treat while sticking to your gluten free or low carb diet. I have an amazing roundup of brunch recipes you have to try. From my Cream Cheese Easy Egg Bake to low carb Mini Bagels and more. Brunch is my favorite meal by far. Maybe it’s because you don’t have it very often or maybe it’s just that brunch has eggs, bacon, pastries, bagels, and so many other yummy options. 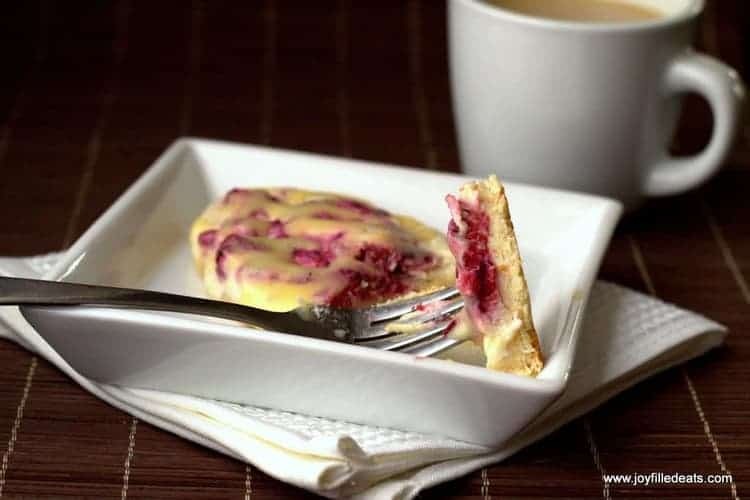 My entire brunch menu, including this Raspberry Cream Cheese Danish Recipe, is low carb, grain free, gluten free, sugar free, and a THM S.
For an extra special treat drizzle on some of my Creamy Lemon Dessert Sauce! Put mozzarella cheese and 2 oz cream cheese in a microwave-safe bowl. Microwave one minute. Stir. Microwave 30 seconds. Stir. At this point, all the cheese should be melted. Microwave 30 more seconds until uniform and gloopy (it should look like cheese fondue at this point). 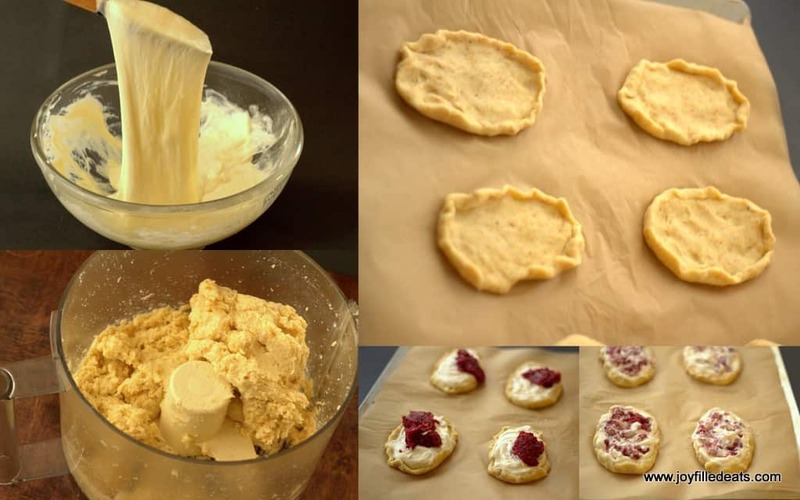 Press into a big rectangle on parchment paper (it helps to wet your hands). Divide into 8 pieces and put them on the prepared cookie sheet. Make the cream cheese topping. Mix cream cheese with egg, sweetener, and vanilla until smooth. I did this in my rocket blender. Spread onto the pieces of dough. Make the raspberry topping. In a small saucepan or in a small microwave bowl heat the raspberries. Stir in the sweetener and sprinkle on the glucomannan. Stir until dissolved. Put a blob of raspberry topping on each danish and swirl it in. It’s pretty thick but you can still flatten and smush it into the cream cheese to combine the two. Bake at 350 for 20-25 minutes until the cheese topping is set and the crust is golden brown. Cool to room temperature. I am always looking for a low carb sweets/desserts/ snacks. This is perfect. Thank you for the recipe. My family would so appreciate these danishes added to our brunch menu ! I just made these and they were delicious! I was afraid they'd be too sweet because the cheese mixture and raspberry mixture are so sweet on their own but when taken as a bit with the "bread" it isn't. I didn't have gluccoman powder so I used xanthan gum powder and it worked fine. Next time I will shape mine with a deeper we'll because my filling spread out and over the edge. Hi, just stumbled over your site, great recipes! I have a question about the mozzarella cheese you are using in your doughs. I get the impression that it isn't the soft, fresh cheese, is it? Is there a name or brand in 'hard' mozzarella cheese that I could use to look further, because I can't find it so far in the Netherlands, and I would love to start experimenting with your tasty dough recipes! These look awesome! Have you tried freezing them? I have not. I'm not sure how well they would freeze. LMK if you try it! Thank you so much! I love everything cream cheese and raspberry! The recipe seemed intimidating but it really didn't take that long to make and I cou literally eat myself to death on these. So glad I tried them! I just popped these into the oven! Only change I made was to add 1 tsp. xanthan gum to the flours. It helps with holding all the nut flour together and is less crumbly. I saw that addition in a bagel dog recipe using the fathead dough. Hope it works...thanks for the great recipes!!! These look amazing do you have the nutritional facts for them? I think so. They are normally interchangeable. My family loves this--we've made it almost every week for a month and a half now. But you have the wrong name for them: my three year old insists upon calling them "handanas." :) Hope you get a laugh out of this! Greetings from Germany, I just found this one via Pinterest and i am so incredibly glad 'bout that. I was very sceptical about mozzarella cheese in the dough. But it is actually awesome! I used almond flour and gluten as low carb flours and it turned out very very well. So thanks for sharing - receipes like that keep my diet going! Just melt the cheese slowly and carefully in a small saucepan over low or medium heat. Once it looks like my photo of the melted cheese you are good to go.